Manage and act upon real-time business intelligence data. iCabbi is the chosen partner of proactive, forward thinking business owners. Our solutions are designed to strengthen your competitive edge. With iCabbi Insights, everyone can answer their own questions and make more informed, data-driven decisions. 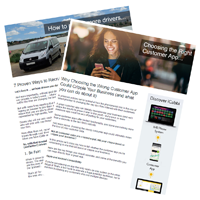 To discover the 8 Key Question to Ask Before You Buy, download our free buyers guide now. For more information call 01623 44 22 11 or email enquiries@iCabbiUK.co.uk.